Those of you who follow my blog know how much I love the enterprising old ladies of Cabramatta who brazenly sell their food and vegetables on the street despite the mean spirited crackdown by Fairfield Council. 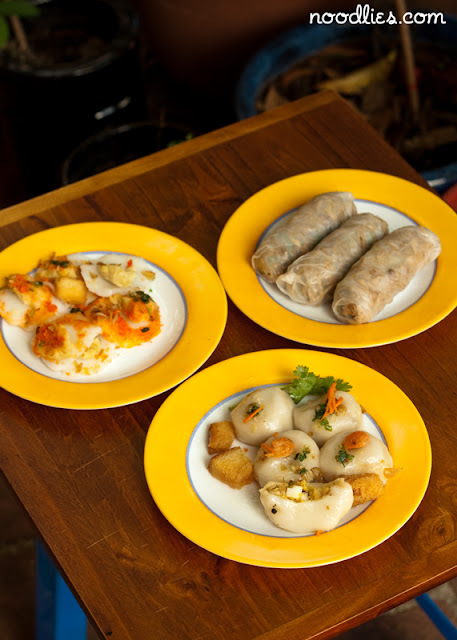 One week it’s banh it, another I buy sam bo luong and another again, it’s nem. 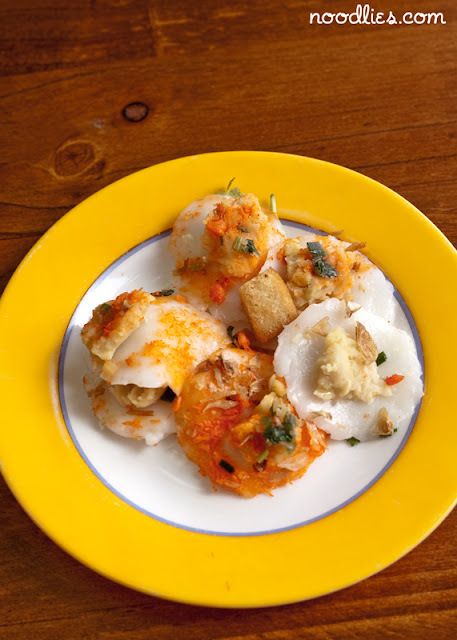 Well recently I went to get banh beo, small white pancakes with bean paste and prawn on top that you pour fish sauce over and devour. B ut do you think I can leave with just one thing, they cajole, they sweet talk, they appeal to my vanity, so I leave with four items… and they came to a grand total of $4! How could I resist. And when I get them home, they make a gorgeous spread, I should have invited friends over, there was enough for an army. 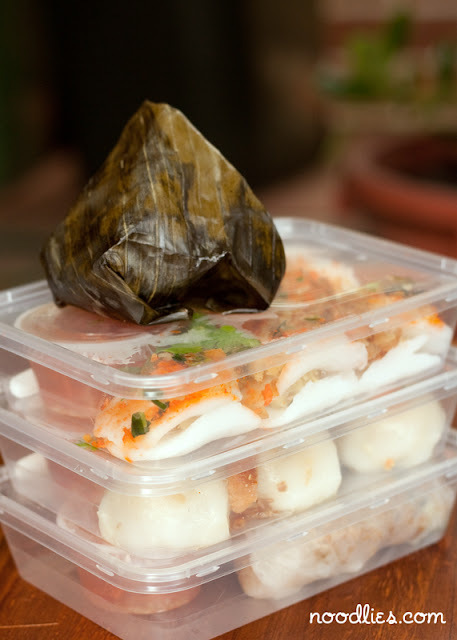 I originally only went for the banh beo (below). And indeed they were delicious. Then I was intrigued by some round dumplings that had mince and bean paste inside, also eaten with fish sauce. I’ve had these before and vaguely remember they may have originated from the north, but can’t remember it’s name. They WERE delicious. Then the old lady next to the one I was buying from said I also had to buy from her, and so I had to out of politeness. So I got the fresh rolls (below), but these one contained bi, which is pork skin (it does taste very good despite my clumsy description). They were all $3 each which came to $9 so the second lady said buy her banh it for $1 to round off to $10. She made it sound like there was a discount, but actually there wasn’t. I didn’t stand a chance. Watch the old ladies of Cabramatta in action below, but be warned they’ll take every penny you’ve got… actually despite my complaints, it was very cheap and I love them all dearly. So, so cool. I wish we had as many "old ladies" as you do! There are only a couple here in Footscray and they mainly sell little bunches of mint and various gourds. 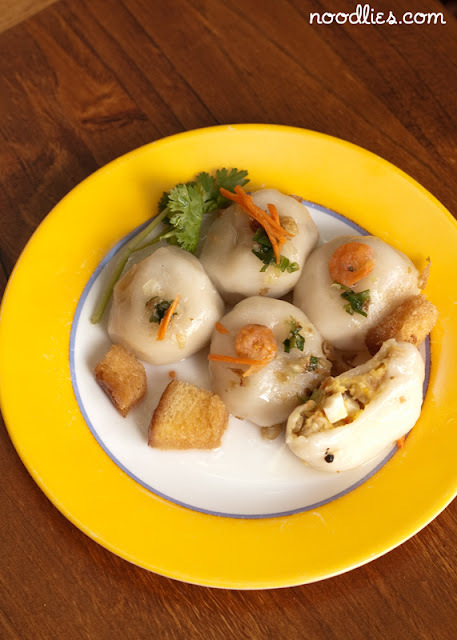 Thanks for the info on the banh it, banh beo and the stuffed dumplings. I have seen some before and never knew what they were called. 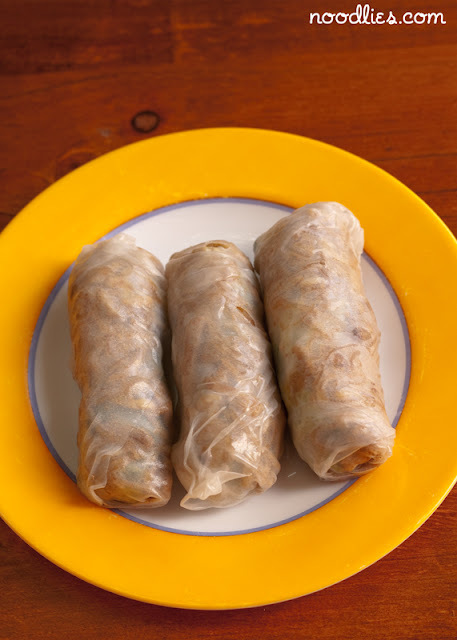 I have been looking for banh beo for ages though and that was one thing I didn't know how it looked, so thanks again! SCREW GROCERY STORES GET IT OFF OLD LADY !! I live in Cabramatta but I’ve never taken noticed of the nooks and crannies of the suburb. Due to your post, I finally managed to try out the banh beo and it was delicious and cheap! I should really take notice of my humble abode more often. yeah they got nice food.. But i feel sorry for them .. last time i saw 2 cops forcing the grandma to stop selling ( no harm ) but she was crying not knowing exactly what the cops were saying but i think she got the message..